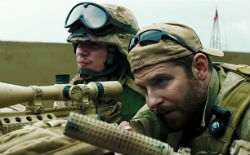 American Sniper grossed record numbers at the U.S. box office this weekend. A surprising result, not least because a high quality leak was widely available prior to the premiere, resulting in millions of pirate downloads and streams. How can this be? When a high quality screener of American Sniper leaked online days before the theatrical release the filmmakers probably feared the worst. After all, recent history has ‘shown’ that early leaks can have a devastating impact on box office revenues. The Expendables 3, for example, grossed a disappointing $16 million during the opening weekend. At the time many insiders and experts blamed the pre-release leak for the disappointing numbers. Millions of people had downloaded pirated copies and skipped the box office, they argued. “This is really a clear situation where this had an impact. It’s hard to measure, but the ripple effect, not only of the downloads, but of the word-of-mouth that spread as a result, can be seen in the soft opening,” BoxOffice.com vice president Phil Contrino said at the time. With American Sniper things turned out quite differently though. Sure, the film was downloaded millions of times before its premiere, perhaps even more than The Expendables 3. However, all these unauthorized downloads couldn’t prevent the film from grossing record numbers. From Friday to Sunday, American Sniper grossed $90.2 million, making it the largest opening weekend in history for the December through February winter period. This means that it beats Avatar, The Hobbit trilogy and all other previous winter blockbusters. For some reason these record numbers were possible despite rampant piracy. How can that be? First of all, the impressive opening doesn’t necessarily mean that the pre-release piracy had no impact at all. Perhaps the film would have raked in an additional $5 million without piracy. On the other hand, some may argue that piracy may even have helped to promote the film through word-of-mouth advertising. In the end we simply don’t know what effect piracy had on the opening weekend. It’s telling though, that every time a film flops piracy is brought into the discussion as one of the main reasons for the disappointing results. But if records are broken, piracy isn’t mentioned at all. In other words, piracy is often a convenient scapegoat used selectively to cover up failures that probably have very little to do with illegal streams or downloads. But there’s nothing new there.